I have had a new digital camera for a little over a month now. I have been trying it out when I get the chance, and am slowly getting used to it. I recently tranferred a batch of photos from the camera into my computer, and today I edited some of them. This image began as a photo that I took with my new camera back in mid-January, very early one winter morning. 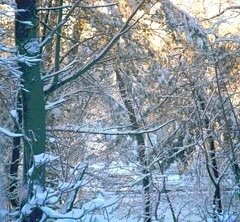 I was attracted by the snowy branches against the pinks and yellows of the January sunrise. Tonight I cropped the image, then opened it in Painter and posterized it. The color of the sky was washed out to white near the top edge of the photo, so I used a gentle color overlay to restore it.